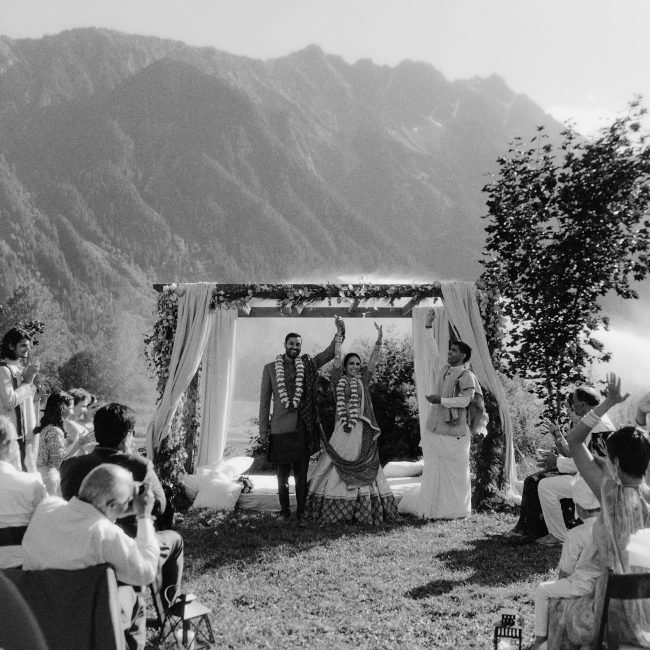 Perhaps, to you, wedding day bliss means saying “I do” at a picturesque B.C. vineyard, warm kisses on a snow-capped mountain, or sinking your toes into an aisle made of sand. We’re right there with you. We’ve planned weddings in Miami, Scottsdale, Los Cabos, Jamaica, Victoria, the Okanagan and beyond, as well as in Alberta’s own beautiful Rocky Mountains: Jasper, Banff, Canmore, Kananaskis and Lake Louise. Where will your love take you? Please contact us for your personalized quote. With you every step of the way. Our Full Service package is designed to suit all your needs and aspirations. Our Full Service package supports and guides you through planning, design, and day-of coordination for the ultimate stress-free wedding day experience. From innovative concept to flawless execution, we’ll provide unlimited professional advice and manage every detail along the way. We’re the first to arrive and the last to leave, giving you peace of mind so that you can bask in every special moment, embrace your guests, and have the time of your life. We’ve got the checklists and the contacts – let’s start illustrating your vision. Above and beyond day-of coordination, plus exclusive vendor perks. Our clients save $1,500 on average when they engage with our recommended vendors. You enjoy planning (and you have the time to do it), but there’s no way you want to be worrying about all the details in the weeks leading up to your big day. We’ll arm you with helpful resources and step in to orchestrate your wedding day, including décor set-up and itineraries for your rehearsal, ceremony, and reception, allowing you the time to relax and cherish this once-in-a-lifetime experience with your family and friends. Contact us today for a complimentary initial meeting. We promise you’ll feel better already. You're a newly engaged couple; but where do you begin? Don't panic. We've already been down the rabbit hole and back again. Location, Location, Location…2-hour consultation session to discuss venue specifications; ceremony and reception location recommendations; up to 6 venue visits (Edmonton Area); facilitation of venue booking process. She Said Yes!…2-hour consultation session to get planning underway; vendor recommendations; personalized planning checklist and budget worksheet. Wedding S.O.S….2-hour consultation session; email summary of major points discussed and any resources referenced during the meeting. Let us know how we can make your wedding planning experience better. Our wedding planning workshops are perfect for couples who have the time (and desire) to plan their own weddings, but could use a little help along the way. Enjoy professional wedding planning guidance through a variety of topics, helpful take-home resources, a décor showcase featuring the latest trends in wedding design and décor, plus exclusive savings from local vendors! Please contact us for more information on future workshops in your area. Whether your goal is to celebrate a milestone, increase sales, or leave a lasting impression, we design experiences and environments that delight and inspire. Please visit JenniferBergmanEvents.com for more information. Custom packages available. We’re happy to work with you to develop a service package that best suits your needs. Please contact us for your personalized quote.